As most of us read the ever more dire headlines about overpopulation, fresh water and topsoil depletion, climate change, armed conflict, mass exploitation, chronic disease and poverty, there is a sense that solving these problems, if they can be solved at all, will be expensive, risky, complicated, and disruptive. Many of us also have a feeling that government and social institutions have become dysfunctional, and that those in key leadership positions are often inadequate to the tasks at hand, or have simply lost their way. All of this leads to a feeling of disempowerment, and perhaps even despair. But what if, as a society, we are missing something major in our assessment? What if there were a simple course of action that could immediately start making things better for all of us, help bring greater justice and ecological balance to our world, and begin to relieve the pressure on those most vulnerable? What if this course of action did not require access to exotic new technologies, vast sums of money, or the passage of any new laws or international treaties? And what if this course of action were within the power of each of us to initiate today, this very moment? As this article points out, such a course of action exists: the adoption of a diet free of animal products. The vegan diet, which was first developed as an expression of a commitment not to participate in the exploitation and harm of others, turns out to also be a supreme expression of environmental sanity. It is the only known method of feeding our current population of nearly 7 billion humans that could conceivably be ecologically and economically sustainable. How interesting, and inspiring, that there exists a course of action that benefits each individual who adopts it, that benefits the local community and our planet as a whole -- a course of action that also simultaneously addresses one of the greatest injustices of our times: the exploitation and killing of billions of sentient individuals whose emotional lives, family bonds, and desire for bodily integrity and happiness are being systematically violated on an unimaginable scale. Not only is another, much better future possible, it is actually within our grasp. Our scientists and scholars are sounding the alarm, which, when added to the voice of our conscience, becomes a truly compelling wake-up call. Changing our ways isn't easy, but what could be more inspiring than doing our part to contribute to restoring the well being of our planet, and to creating justice for billions of vulnerable beings? There has never been a better time to take action, never better reasons to act, and never a more certain way of making a meaningful difference. 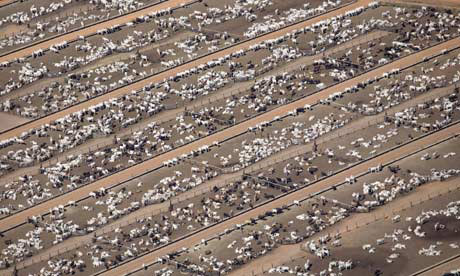 To read the latest World Watch study on climate change, see "Livestock and Climate Change: What if the key actors in climate change are cows, pigs and chickens?". Our scientists and scholars are sounding the alarm, which, when added to the voice of our conscience, becomes a truly compelling wake up call. The recommendation follows advice last year that a vegetarian diet was better for the planet from Lord Nicholas Stern, former adviser to the Labour government on the economics of climate change.